You may remember that before my other blog crashed, I was talking about a crocheting project that I’d finished but hadn’t managed to get a proper picture of. (To be honest, half the delay was because I hadn’t bothered ironing it yet…) After about half an hour of fiddling with the self-timer setting on my shiny new camera, I got a useable photo. It’s a starf! I mean, it’s a scarf, shaped like a shooting star – a shooting starf. 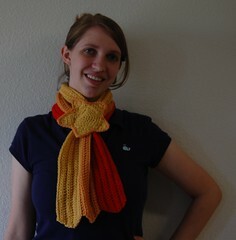 I used Knit Picks Merino Style, and it is just gorgeous. I’ve heard a lot about how pilly merino wool is, but it wears like iron compared to the Main Line I used for my cloche. (At least, so far. I haven’t exactly been tobogganing in it or anything, but it’s not fuzzy yet, which is more than I can say for the Main Line.) I’m pretty sure this is the first project I’ve ever done that was made with nice, new wool, and now I understand what people mean when they say that wool is ‘springy.’ That’s the perfect word to describe it. As far as this specific yarn goes, (if you’re looking for a review) Merino Style is very soft. I have no qualms about wrapping it around my neck. The stitch definition is great – I used crocheted ribbing, which can look very flat in the wrong yarn or gauge, and it looks beautiful. This would probably look very nice with a cables. I like the colors: they’re strong and saturated without looking like a box of markers. Would I use it again? Oh my, yes. Lovely, soft, warm, rather inexpensive – I can absolutely foresee myself purchasing this yarn for another project. 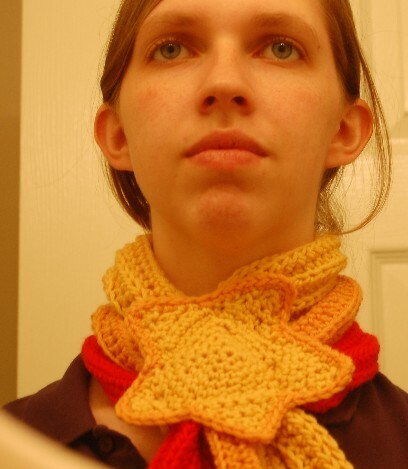 Getting back to the starf, I made it short enough that it only goes around the neck once, but wide enough that it scrunches to provide nice, cozy warmth. A loop on the back of the star secures the end, which reappears out from under it like the tail of a shooting star! It’s a simple design, but I really like it. The concept has been loitering in my design file for years. Another one down! Unfortunately, it’s much faster to think of these things than to execute them. I have a feeling I may never get to all of them. In other news, it’s been raining here. A lot. For a long time. Texas is flooding. And while it does keep the temperature down (a bit) and saves me having to water my grass, I have to wonder what nasty bug or disease or wild animal is going to appear on the scene, that only comes out when you get rain several times a week for a month or two. Any guesses? This entry was posted in Finished, Yarn and Reviews. Cool scarf!!! You’ll actually get to use it too!!! You can wear it to the premier of “Stardust” this Friday! oh, i love this!! are you going to share (or sell) this pattern? That is so wicked awesome!! I love it. I want one. 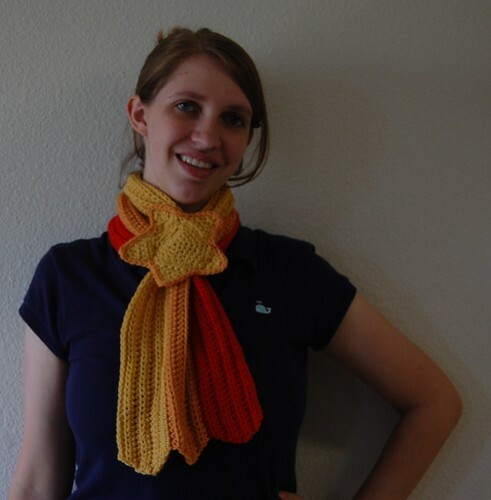 Now, if I had a scarf like that I would be so excited for winter. Will there be a pattern of this perhaps? It’s very cute!